2019/03/14 — High Tech— Latest developments. 2019/03/12 — Internet Journals — Alternative media. 2019/03/09 — Extracting energy from the vacuum — Some ways it can be done. Further. And more. 2019/02/31 — How to Survive a Solar Proton Flare — One or more solar proton events may have caused a mass extinction event 12900 years ago, and could happen again. 2019/02/31 — Earth Changes — What may be coming. 2019/02/21 — Earth Rule — In the end there can be only one. 2019/02/02 — Where Aren't They? — The galaxy may be crowded with aliens. 2015/07/02 — Suffolk Resolves (1774) — Developed the issues that led to the Declaration of Independence. 2015/04/16 — The North Briton, Number 45, John Wilkes. (1763) — Inspired the Americans to demand their rights, and when Wilkes and others were prosecuted for seditious libel for this article, led the Americans to conclude there was to be no reconciliation with the English crown; it also inspired the First and Fourth Amendments. 2015/02/26 — Howell's State Trials — A Collection of important State Trials, from 1063 through 1815, compiled and edited by Thomas Bayly Howell, in 33 Volumes. These cases provide precedents that defined many of the terms used in the U.S. Constitution. 2014/12/12 — A Caveat Against Injustice, or An Inquiry into the Evils of a Fluctuating Medium of Exchange, Roger Sherman, 1752. One of the Framers presents his theory of money. 2014/11/29 — A Treatise on the Law of Citizenship, Prentiss Webster, 1891. Early classic treatise. 2014/11/29 — A Treatise on American Citizenship, John S. Wise, 1906. Early classic treatise. 2014/11/29 — The Legal-Tender Acts, considered in relation to their constitutionality and their political economy, Samuel T. Spear, 1875. Early classic treatise. 2014/11/29 — The Theory of the Common Law, James M. Walker, 1852. Early classic treatise. 2014/11/29 — A Treasury of Legal Quotations, ed. Paul C. Cook, 1961. Excellent collection. 2014/11/29 — A Treatise on the Law Concerning Names and Changes of Name, Arthur Charles Fox-Davies, 1906. Early classic treatise. 2014/11/29 — The Treaty Power under the Constitution of the United States, Robert T. Devlin, 1908. Early classic treatise. 2014/11/29 — Trading with the Enemy in World War II, Martin Domke, 1943. Review of cases. 2014/10/04 — Money and Civilization, Alexander del Mar, 1867. Early classic treatise. 2014/10/04 — History of Monetary Systems, Alexander del Mar, 1895. Early classic treatise. 2014/10/04 — History of Money in America, Alexander del Mar, 1899. Early classic treatise. 2014/10/04 — Natural Law of Money, William Brough, 1896. Early classic treatise. 2014/10/04 — Gold and Silver Coinage under the Constitution, U.S. Statutes, 1789-1896. 2014/10/04 — Legal Tender: A Study in English and American Monetary History, S.P. Breckinridge, 1903. 2014/10/04 — The First and Second Banks of the United States, John Thom Holdsworth, Davis Dewey, 1910. 2014/10/04 — State Banking Before the Civil War, Davis Dewey; The Safety Fund Banking System in New York: 1829-1866, Robert Paddock, 1910. 2014/09/01 — Observations on the new Constitution, and on the Federal and State Conventions, Columbian Patriot [Mercy Otis Warren], (1788) — Opposition to ratification of the U.S. Constitution without a bill of rights, from a leading intellectual leader of the American Revolution. 2014/09/01 — History of the rise, progress, and termination of the American Revolution, Mercy Otis Warren. (1805) — History from one of the leading intellectual leaders of the American Revolution. 2014/08/25 — Founding-Era Translations of the United States Constitution — The Constitution was translated from English into German and Dutch at ratification, for the substantial number of people in Pennsylvania and New York who did not speak English. This document sets out the different texts and translations alongside one another. 2014/06/15 — U.S. Treasury Reports, complete collection, 1789-1980. 2014/06/04 — Politics and the English Language, George Orwell (1946) — Short essay on the political uses of English. 2014/05/24 — Nineteen Propositions from Parliament to Charles I, and his answer, (1642) — Parliament demanded power from the king, and he made a defense of mixed government. This was the break that led to the English Civil War. 2014/05/20 — Women's Rights in Early England, Christine G. Clark, Brigham Young University Law Review 1, 1995. 2014/05/12 — Journals of the Continental Congress, 1774-1789 — Government under the Articles of Association and Articles of Confederation. 2014/05/10 — A Readable Edition of Coke upon Littleton, ed. Thomas Coventry (1830) — Cleaned but with the margin notes omitted. HTML version still needs some work. 2014/05/01 — A Treatise on the Constitutional Limitations Which Rest Upon the Legislative Powers of The States of the American Union, Thomas M. Cooley (1868) — Commentary reflecting constitutional thought at the time. 2014/05/01 — The General Principles of Constitutional Law in the United States of America, Thomas M. Cooley (1891) — Introduction by the leading constitutional scholar of his era. 2014/05/01 — An Inquiry into the Principles and Policy of the Government of the United States, John Taylor (1814) — A response to John Adams' A Defense of the Constitutions of Government of the United States of America by a leading theorist of the Jeffersonian republicans. 2014/05/01 — Letters of Junius, Unknown (1767-72), Volume I — Letters from an English Whig and ally of Lord Camden against the efforts of Lord Mansfield to restrict the role of juries, and on other constitutional topics. 2014/05/01 — Institutes of natural law, Thomas Rutherforth (1754, Second American ed. 1832) — Lectures on Grotius De jure belli et pacis. 2014/04/28 — Law Dictionary, Jacob Giles, 6th Ed. 1750. 2014/04/20 — Iberian Constitutional History, 600-1492. May have inspired development of constitutional thought in England and other countries. 2014/04/06 — Constitution of the Holy Roman Empire, (962-1806) — A dominant European nation that was a confederation of states, headed by an elected monarch with limited power. It's "constitution" provided some ideas to the American Framers. 2014/04/05 — Fonet: A new phonetic alphabet for English — Essential for spelling reform. 2014/03/31 — Dissoi Logoi: Two-Fold or Contrasting Arguments, Anonymous (c. 425 BCE), Presentation of the method of using opposing arguments to elicit understanding, and as a tool of the sophists. 2014/03/30 — Select Documents of English Constitutional History, George Burton Adams and H. Morse Stephens (1904) — Collection of excerpts from the main documents that comprise the English "constitution". 2014/03/30 — The English Constitution, Walter Bagehot (1872) — Discussion of the English "constitution" as of that time. 2014/03/08 — Statute of Quo Warranto (1290) — Codified the writ of quo warranto as a pleading in English courts, and laid the basis for the writ of habeas corpus. 2013/11/30 — Swiss Federal Charter (1291) — The beginning of the Swiss federal republic that inspired Locke's notion of the social contract and the American Constitution. 2013/11/29 — Union of Utrecht, (1579, tr. Herbert H. Rowen 1972) — Treaty that formed the basis of the constitution of the United Provinces of the Netherlands and was the inspiration for the American Articles of Confederation. 2013/07/18 — Brevissima Relacion, or Short Report on the Destruction of the Indies, Bartolomé de las Casas (1474-1566) — Spanish Dominican priest, early champion of the rights of indigenous peoples. One-sided but influential polemic that brought pressure to better treat Native Americans and recognize natural rights of people everywhere. 2013/06/22 — Elementary Catechism on the Constitution of the United States, Arthur J. Stansbury (1828) — Q&A for the teaching of students. 2013/05/24 — Early State Constitutions — State constitutions in use from independence through adoption of the U.S. Constitution, for which they served as models. 2013/01/10 — Liber Augustalis, or, Constitutions of Melfi (1231) — Holy Roman Emperor Frederick II established basic laws for the Kingdom of Sicily that provided model for later constitutions of government. 2012/09/03 — Charter of the Forest (Carta de Foresta) (1217) — Henry III established rights of freemen to use forest resources. 2012/05/23 — Reforms of Simon de Mortfort (1258-65) — Had he not lost a battle, his reforms might have ended monarchy and established republican government four centuries before Cromwell and Lilburne. 2012/05/03 — Internment and Resettlement Operations, U.S. Dept. of the Army, FM 3-39.40, February, 2010 — The manual outlines policies for processing detainees into internment camps both globally and inside the United States. 2012/04/20 — U.S. Grand Jury Standards, Jon Roland — Specification for a grand jury system to comply with original understanding of the U.S. Constitution. 2011/11/22 — Internal Revenue Regulations — Through 2003. 2011/02/09 — De Moneta, Nicholas Oresme, 1484. Translated from Latin by Charles Johnson — Classic treatise on money and coinage. 2011/01/09 — The crisis: or, Essays on the usurpations of the federal government, Robert James Turnbull, Brutus (pseud.) (1827) — Discusses the misconstructions of the Constitution by the Supreme Court and Congress from a Jeffersonian standpoint, and develops the concept of state-level nullification. 2011/01/04 — Patient Protection and Affordable Care Act. Act of Congress, sometimes called "Obamacare", which threatens our constitutional liberties. 2010/12/11 — Varieties of jurisdiction, Jon Roland. 2010/10/08 — Judicial Tyranny and Your Income Tax, Jeffrey Dickstein, 1990, 2010 — Review of leading cases, showing compensation for labor is not "income" subject to taxation. 2010/07/13 — Georgicum: or a supplement to the mirror of justices; being an account of some instances of the practice of former times, in order to the improvement of justice and safeguard of the constitution, Anonymous (1716) — Recounts how corrupt judges were held accountable. 2010/02/22 — Contemporary Opinion of the Virginia and Kentucky Resolutions, Frank Maloy Anderson, The American Historical Review, No. 1, pp. 45-63 (October 1899), and No. 2, pp. 225-252 (December 1899) — Review of reactions to those resolutions. 2010/02/18 — Section 1706 — Example of tax code being used to suppress small competitors. 2009/10/04 — Lectures on the Constitution — Jon Roland, 2008-2009. 2009/10/04 — Continental Congress 2009 Videos — Including those from the Oct. 3, 2009, Meet the Candidates gathering at the Silver Eagle Taphouse, McQueeney, Texas, and the Austin election Oct. 10, 2009. 2009/08/06 — Logic of Judges, by Jon Roland — Discussion of how judges are logically challenged. 2009/07/26 — The Laws and Liberties of Massachusetts, Excerpts (Adopted 1647, published 1648) — Codification of major parts of the common law that served as a constitution for Massachusetts into the 18th century. 2009/04/13 — Draft Amendments to U.S. Constitution — A few amendments that might help return constitutional construction to original understanding. 2009/04/13 — Military Affairs. Reports to the U.S. Congress on military and militia matters. Volume 1 contains reports from Mar. 3, 1789, through Mar. 3, 1819. See particularly the reports on militia organization and militia returns showing organization and strength. Provides insight into original thinking on militia and the right to keep and bear arms. 2009/04/07 — Parliamentary Procedure — Links to resources on making decisions in deliberative assemblies. 2009/04/06 — Wikipedia Articles of Interest. Check these for fidelity to their subjects. 2009/04/05 — U.S. State Legislative Rules of Procedure — Rules for each state. 2009/03/25 — Translations of Robert's Rules of Order, Revised — First translation is into Portuguese. 2008/08/26 — Mostly Unconstitutional: The Case Against Precedent Revisited, Gary Lawson, 5 Ave Maria L.R. 1 (2007). 2008/08/26 — The Constitutional Case Against Precedent, Gary Lawson, 17 Harv. J.L. & Pub. Pol'y 23, 24 (1994). 2008/06/27 — Black's Law Dictionary, 2nd Ed. 1910. 2008/06/24 — Solar Power Satellites — Solution to need for energy. 2008/01/19 — The English Constitution, John Louis De Lolme (1771) — Discusses separation of powers, the jury system, and habeas corpus. 2008/01/04 — Purchase Links for the Liberty Library — Convenient links to purchase print editions of our online works. 2007/12/28 — Letters of Marque and Reprisal — Collection of historical examples with analysis. 2007/11/13 — Militia Reading — Published works that discuss matters related to the constitutional militia and the constitutional militia movement. 2007/09/16 — United States v. Fenwick, 25 F. Cas. 1062 (1836); 4 Cranch C.C. 675 — Defense in criminal trial has right to argue law before jury until bench rules on motion. 2007/09/15 — Stettinius v. United States, 22 F. Cas. 1322 (1839); 5 Cranch C.C. 573 — Defense in criminal trial has right to argue law before jury until bench rules on motion. 2007/08/19 — Addressing the Constitutionality of the Independent Counsel Statute: Executive Control over Criminal Law Enforcement: Some Lessons from History, Harold J. "Hal" Krent, 38 Am. U.L. Rev. 275, Winter, 1989, — Interesting review of private criminal prosecutions in history. 2007/04/12 — Revenue Act of 1942 — This was what first introduced withholding "tax" on wages. 2007/04/12 — Social Security Act of 1935 — Compare to the present system. 2007/03/18 — The Law That Always Was, Vern Holland (1987) — Treatise on the legitimacy of the income tax. 2006/09/24 — Works of James Wilson (1804) — Includes "Lectures on Law, 1790-1792" and other writings of the Pennsylvania delegate to the Constitutional Convention. 2006/09/05 — W A brief disquisition of the law of nature, according to the principles laid down in the reverend Dr. Cumberland's (now Lord Bishop of Peterborough's) Latin treatise on that subject. As also his considerations of Mr. Hobbs's principles put into another method., James Tyrrell (1692) — Disquisition on natural law theory. 2006/02/14 — Internal Revenue Code — 26 USC, as of January 1, 2002. 2006/02/01 — Martyrdom of King Charles I, W. Delavne (1703) — Sermon before House of Commons. Comments on some of the constitutional issues involved in the trial and execution of that monarch. 2005/11/08 — Presumption of Nonauthority and Unenumerated Rights, by Jon Roland, Begun November 6, 2005, in progress. 2005/08/11 — Britton, (written ~1290, printed ~1530) — Abridged, updated, more readable, and more widely used codification based on Bracton, originally in the French of the English court, reflecting changes in the law, including changes in juries. 2005/08/07 — Is Codification of the Law Expedient?, by William B. Hornblower. Address delivered before the American Social Science Association (Department of Jurisprudence) at Saratoga, N.Y., September 6, 1888. — Discussion of debate over whether and how to adopt statutes that codify common-law judicial precedents. 2005/08/02 — The Trial of Thomas Paine for a Libel, Thomas Paine. (1792) — British government prosecuted Paine for publishing Rights of Man. 2005/08/01 — Mansfieldism Reconsidered, by Jon Roland — Review of evidence for arguing law in the presence of the jury. 2005/07/12 — Address on Libels, Case of John Horne, John Horne Tooke. (1777) — Criticism of indictment by information, rather than by grand jury. May have contributed to requirement for grand juries in U.S. Bill of Rights. 2005/07/12 — Observations on the Trial by Jury, Attributed to John Longley. (1815) — Commentary on the role of the jury in Britain, reflecting the gain of the Mansfieldian movement. 2005/07/12 — Observations on the Trial by Jury, Anonymous. (1803) — Advice to the Pennsylvania Legislature on the role of the jury. 2005/07/12 — The Trial of Thomas Hardy for High Treason. (1794) Provides insight into the practice of law in England and the interplay of conflicting political forces. 2005/07/12 — The Case, Trevett against Weeden, for refusing Paper Bills in Payment. (1787) This legal tender action may have inspired the prohibition in the U.S. Constitution of states making anything but gold or silver legal tender. 2005/07/12 — The Trial at Large, ... In the Nature of a Quo Warranto, Against Mr. Thomas Amery, , ... of the City of Chester. (1786) This quo warranto action was submitted for decision by a jury. 2005/07/12 — The Trial of John Almon, Bookseller, ... For selling Junius's Letter. (1770) Publication of the Letters of Junius was prosecuted as a criminal libel of the English government. 2005/07/08 — The Two Trials of John Fries for Treason. (1800) Provides insight into the practice of law in England and the interplay of conflicting political forces. 2005/07/07 — A Complete Collection of State-Trials, and Proceedings For High-Treason, And Other Crimes And Misdemeanours; From the Reign of King Richard II to the Reign of King George II. in Six Volumes. 2005/07/07 — The Present Practice of the Court of Common Pleas, Joseph Harrison. (1761) — Provides insight into the early practice of law. 2005/07/07 — The Attorney's Practice in the Court of Common Pleas, Robert Richardson. (1778) — Provides insight into the early practice of law. 2005/07/07 — The English Lawyer, showing the Nature and Forms of Original Writs, Processes, and Mandates, William Bohun. (1732) — Provides insight into the early practice of law. 2005/07/06 — The Subject's Right of Petitioning, Anonymous. (1703) — Provides insight into the original meaning of the right to petition. 2005/07/06 — Tracts on Political and Other Subjects, Joseph Towers (1796) — Followup on his earlier writings on the role of juries. 2005/07/06 — Essays and Treatises on Moral, Political, and Various Philosophical Subjects, Emanual Kant (1798) — Includes some of Kant's lesser-known writings. 2005/07/06 — Short Hints upon Levelling — A Charge to the Grand Jury of Middlesex, William Mainwaring. (1791) — Reveals Tory-Mansfieldian linking of jury rights to fears of property re-distribution. 2005/07/06 — Considerations on the Respective Rights of Judge and Jury; Particularly upon Trials for Libel, John Bowles. (1791) — Leading exposition of the Mansfieldian movement to curtail the role of juries, which spread to the United States. 2005/07/06 — A General Charge to All Grand Juries, and Other Juries, James Astry. (1725) — Provides insight into the early role of juries. 2005/07/04 — An Argument in Defence of the Exclusive Right Claimed by the Colonies to Tax Themselves, with a Review of the Laws of England, Relative to Representation and Taxation, to Which is Added, an Account of the Rise of the Colonies, and the Manner in which the rights of the subjects within the realm were communicated to those that went to America, with the exercise of those rights from their first settlement to the present time. (1774) — Arguments of English members of Parliament who agreed with the protests of the American colonists. 2005/07/04 — An Analysis of the Laws of England, William Blackstone. (1762) — Commentary on early English law. 2005/07/04 — The Miscellaneous Works of J. J. Rousseau (1774) — Includes Social Compact and A Project for a Perpetual Peace. 2005/07/04 — The Dissertation of John Selden, Annexed to Fleta. (1771) — Commentary on early English law. 2005/07/04 — Appeal Brief in Matson v. Thomas, John Valentine (1720) — Oldest known legal brief in British North America, got precedent that British colonists in North America had inherited the rights of Englishmen, laying the foundation for the American War of Independence. 2005/07/04 — Selected Works of Edward Coke (~1628) — Commentary on English common and statutory law, including the Institutes and the Reports. 2005/06/30 — Lives of the Noble Grecians and Romans, Plutarch (~75) — See especially the lives of Solon, Lycurgus, Pericles, Marcus Cato, and Cato the Younger. 2005/03/22 — The Trial of John Peter Zenger, 1735. 17 How. 675. The jury decided that truth was a defense against libel. 2005/03/15 — U.S. Statutes at Large, complete collection, 1789-2007. Completed 2009/01/05. 2005/03/13 — Citizenship, U.S. War Department Training Manual 2000-25 (1928) — Civics textbook for training Army troops. 2005/01/01 — Legal Research by the use of Corpus Juris Secundum, Donald J. Kiser (1924) — Guide for students of the law. 2004/12/19 — The Elements of the Common Lawes of England, Francis Bacon (1630) — Treatise on English Common Law. 2004/12/16 — An account of Denmark, as it was in the year 1692, Robert Molesworth (1694) — Commentary on Denmark that is really a commentary on constitutional issues in England. 2004/12/12 — W The American Manual, or, The Thinker, Joseph Bartlett Burleigh (1854) — Civics textbook focusing on U.S. Constitution. 2004/11/01 — Inquiry into the Moral and Religious Character of the American Government, H. W Warner (1838) — Commentary on the relation between government and religious practices. 2004/07/13 — Cooper Union Address, Abraham Lincoln, February 27, 1860. 2004/05/18 — Policraticus, John of Salisbury (1159), various translations — Argued that citizens have the right to depose and kill tyrannical rulers. 2004/04/27 — The Mechanism of the Modern State, John A.R. Marriott (1927) — An analysis of the British system of government compared to other systems, especially those of ancient Athens, Switzerland, and the United States. 2004/04/25 — A Summary of the Law of Contracts, C. C. Langdell. (1880) — Develops an interpretative approach to law based on private (contract) law, from the formalist standpoint. 2004/04/25 — A Brief Survey of Equity Jurisdiction (Selections), C. C. Langdell. (1908) — Exposition from formalist standpoint. 2004/04/24 — A Treatise on the Conflict of Laws (Selections from), Joseph H. Beale (1935) — The topic is developed with a historical and theoretical perspective. 2004/04/19 — The Nature of the Judicial Process, Benjamin N. Cardozo (1921) — Discusses the debate between legal realists and constitutionalists. 2004/04/06 — If It's Not a Runaway, It's Not a Real Grand Jury, Roger Roots, Creighton L.R., Vol. 33, No. 4, 1999-2000, 821 — Examines constitutional issues involved in current practices involving grand juries. 2004/03/30 — George Mason's Master Draft of the Bill of Rights, 1788 June 9. 2004/03/16 — The Lost History of the Ninth Amendment: The Lost Original Meaning, by Kurt Lash, Professor of Law and W. Joseph Ford Fellow, Loyola Law School, Los Angeles, Feb. 2004. 2004/03/01 — Woe Unto You, Lawyers, Fred Rodell, Professor of Law, Yale University, 1939 — Criticizes the legal profession. 2004/01/10 — W The Constitution of the United States, John Randolph Tucker (1899) — Commentary by the grandson of the editor of Tucker's Blackstone. 2003/12/02 — Are Cops Constitutional?, Roger Roots, Seton Hall Constitutional L.J. 2001, 685 — Examines constitutional issues involved in professional law enforcement. 2003/11/06 — Losing Liberty Judicially, Thomas James Norton (1928) — Examines how courts have gone along with departures from original understanding. 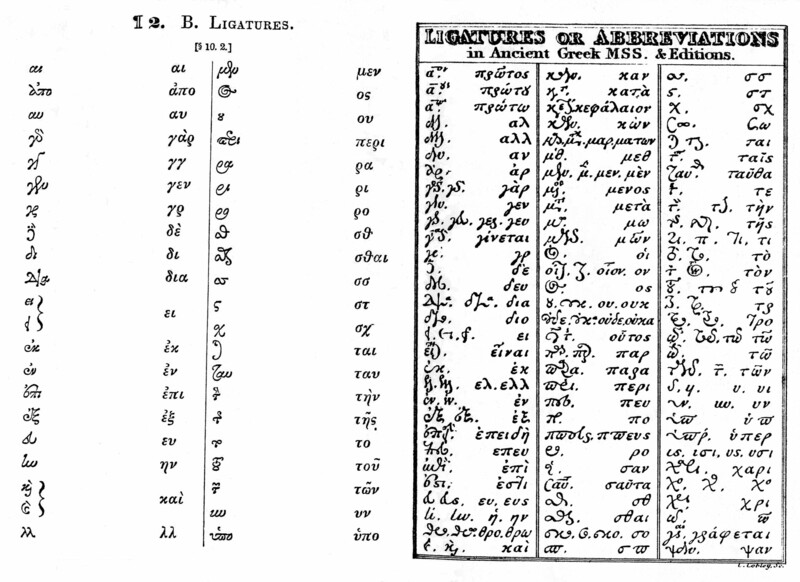 2003/11/06 — Greek Ligatures — Tables of ancient and medieval character combinations and abbreviations, useful for rendering manuscripts into Greek fonts. 2003/09/24 — De jure magistratuum (On the Rights of Magistrates), Theodore Beza (1574) — Swiss Calvinist theologian, Knox's co-pastor in Geneva, argues that lower level magistrates have duty to defend people from higher level magistrates. 2003/09/16 — On Misreading John Bingham and the Fourteenth Amendment, Richard L. Aynes, Yale Law Journal, October, 1993, Page 57 — Argues that the Fourteenth Amendment was understood by its authors and ratifiers as extending the jurisdiction of U.S. Courts over cases between a citizen and his state over rights protected in the U.S. Constitution. 2003/09/14 — A Treatise on American Citizenship, John S. Wise (1906) — Discussion of the history and principles of various kinds of citizenship. 2003/08/24 — The History of the Common Law of England, Matthew Hale (1713) — Important reference for the Founders. 2003/08/19 — The Path of the Law, Oliver Wendell Holmes, Jr., 10 Harvard Law Review 457 (1897) — Classic statement of the doctrine of legal realism, that the "law" is what judges do, or can be expected to do, rather than what is logically required from first principles or historic enactment of black letter law. 2003/06/23 — Journal of William Maclay — Maclay served as senator from Pennslyvania from 1789 to 1791 and kept a private journal of his experiences that is highly revealing. 2003/06/14 — Evolving Complex Networks in Constitutional Republics, by Jon Roland — Examines how changing network structures can reveal how political and economic processes behave and misbehave. 2003/06/10 — Fairfax County Resolves (1774) — Developed the issues that led to the Declaration of Independence. 2003/06/08 — Constitutional View of the Late War between the States, Alexander Stephens (1868) — Vice-President of the Confederacy explains why the war was fought. 2003/05/31 — Abuse of Judicial Discretion, Jon Roland. 2003/05/23 — Laws, Plato (~348 BCE) — Model laws for a republic, including sortition and militia. 2003/05/21 — A Short Treatise on Political Power, John Ponet (1556) — Argues political power is limited by natural law, and no ruler may exercise absolute power. 2003/05/08 — Discourse on the Constitution and Government of the United States, John C. Calhoun. 2003/04/24 — Still the Law of the Land? — Essays on Changing Interpretations of the Constitution. Forward by Forrest McDonald. © 1987. Hillsdale College Press. 2003/03/23 — An Essay on the Lacedæmonian Government, Walter Moyle (1698) — How the Spartan constitution given by Lycurgus inspired English political philosophers. 2003/03/10 — Considerations on the Constitutionality of the President's Proclamations, John Henderson (1854) — Commentary on executive orders. 2003/03/01 — Considerations on the Causes of the Greatness of the Romans and their Decline, Charles Montesquieu (~1734) — Historical analysis that laid the basis for his Spirit of Laws and Gibbon's Decline and Fall of the Roman Empire. 2003/02/17 — Lopez Speaks, Is Anyone Listening?, David B. Sentelle — DC Circuit Justice reviews reception to U.S. v. Lopez. 45 Loy. L. Rev. 541, Fall, 1999. 2003/02/07 — Two Essays: On the Foundation of Civil Government, On the Constitution of the United States, Thomas Cooper (1826) — Commentary on constitutional theory. 2003/02/05 — The Leveller Movement, Theodore Calvin Pease (1916) — A study in the history and political theory of the English Great Civil War. 2003/02/04 — Three Human Rights in the Constitution of 1787, Zechariah Chafee, Jr. (1956) — Historical analysis of free debate, prohibition of bills of attainder, and freedom of movement. 2003/01/13 — Tucker's Blackstone — The Commentaries on the Laws of England by William Blackstone was the canonical codification of the Common Law, but it needed to be adapted to the needs of the U.S. Constitution. This was done in 1803 by St. George Tucker, one of the Founders, who republished the Commentaries, and added commentaries of his own, making the needed adaptations. 2003/01/10 — The Civil Law, tr. & ed. S. P. Scott (1932) — Includes the classics of ancient Roman law: the Law of the Twelve Tables (450 BCE), the Institutes of Gaius (180), the Rules of Ulpian (222), the Opinions of Paulus (224), the Corpus Juris Civilis of Justinian (533), which codified Roman Law, and the Constitutions of Leo. 2003/01/02 — The Common Law, Oliver Wendell Holmes, Jr. — Discussion of some but not all of the elements of the Anglo-American common law. 2002/12/24 — Nondelegation and the Administrative State — Questions of the legitimacy of delegations of legislative powers to executive branch agencies. 2002/12/19 — Case of the Imprisonment of Edward Bushell, for alleged misconduct as a Juryman, 1670. 22 Charles II. 6 How. 999. Having failed to convict Penn, the prosecution sought to punish the jurors, but failed, thereby establishing the right and duty of juries to judge the law as well as the facts in criminal trials. 2002/12/19 — The Trial of William Penn and William Mead, at the Old Bailey, for a Tumultuous Assembly, 1670. 22 Charles II. 6 How. 951. Established the right of religion. 2002/12/02 — Sortition for Judges, by Jon Roland. 2002/10/26 — The Sortition Option — Articles and links on this method. 2002/08/12 — Selected Works of Marchamont Nedham (~1650) — English columnist comments on political issues of his era. 2002/08/04 — W Introduction to the Study of the Law of the Constitution, Albert Venn Dicey (8th Ed., 1914) — Comparative analysis of the constitutional orders of several nations, focusing on Britain. 2002/08/04 — Lex, Rex (The Law is King), Samuel Rutherford (1644) — Theological arguments for the rule of law over the rule of men. 2002/07/23 — Texas Textbook Review — Efforts to reform the ways textbooks are written. 2002/07/19 — The General Principles of Constitutional Law in the United States of America, Thomas M. Cooley (1891) — Introduction by the leading constitutional scholar of his era. 2002/06/27 — The Evolution of the Constitution of the United States, Sydney George Fisher (1897). Traces each of the clauses of the U.S. Constitution back to previous colonial, state and other government documents. 2002/06/25 — A Constitutional History of the United States, Andrew McLaughlin (1936) — Perhaps the best single textbook on the subject, winner of the 1936 Pulitzer Prize. 2002/06/24 — State Documents on Federal Relations, Herman V. Ames (1911) — Debates among the states on the Constitution, 1789-1861. 2002/06/01 — Construction Contrued and Constitutions Vindicated, John Taylor (1820) — A commentary on some of the misconstructions of the Constitution by the Marshall Court. 2002/05/23 — Tyranny Unmasked, John Taylor (1821) — An attack on the constitutionality of protective tariffs and other violations of the original understanding of the Constitution, as seen by the leading spokesman for the Jeffersonian "Old Republicans". 2002/05/10 — A Healing Question, Sir Henry Vane (1656) — He was tried for writing this in a famous trial that tested the right of free speech. 2002/05/07 — A Dissertation on the Nature and Extent of the Jurisdiction of the Courts of the United States, Peter Stephen Du Ponceau (1824) — Discusses the various kinds of jurisdiction, in locum, in personam, and in subjectam materiam, and the limits of the jurisdictions of each kind of court. 2002/05/05 — A Brief View of the Constitution of the United States, Peter Stephen Du Ponceau (1831) — Introduction to the Constitution for students and foreigners. 2002/04/18 — Union Now, Clarence K. Streit (1939) — Classic treatise on international conflict and federalism. 2002/04/14 — Discourse on Voluntary Servitude, Étienne De La Boétie (1548, tr. Harry Kurz 1942) — People are ultimately responsible for their servitude, and non-violent resistance can win their freedom. 2002/04/10 — A living constitution or fundamental law?, Herman Belz (1998) — American constitutionalism in historical perspective. 2002/03/09 — Cato (A Tragedy in Five Acts), Joseph Addison (prem. 1713) — Play about Cato the Younger, which inspired the Founders, especially George Washington. 2002/03/04 — The Student Council, Harry C. McKown (1944) — Classic treatise on the subject that the webmaster used to draft a student constitution in high school. 2002/03/02 — First Principles, Herbert Spencer (1862-99) — Spencer sets forth the fundamentals of his philosophic views. 2002/02/16 — Criminal Libel and the Duty of Juries, Joseph Towers (1764, 1784), Francis Maseres (1792) — Three essays on the right of defendants, especially in criminal libel cases, to have the jury decide the law as well as the fact issues. 2002/01/14 — The Elements of the Art of Packing, As Applied to Special Juries, Particularly in Cases of Libel Law, Jeremy Bentham (written 1809, published 1821) — Critical treatise on abuses of the English jury system and ways to reform it, which provides a historical background to practices that continue to this day. The first publisher in 1817 of excerpts from this work was prosecuted twice for doing so, and the second three times, but in each attempt, juries acquitted them. 2002/01/07 — Sources of the Constitution of the United States, C. Ellis Stevens (1894) — Traces each of the key provisions of the Constitution and Bill of Rights to their historical sources. 2001/12/20 — The Law of Treason in the United States, James Willard Hurst (1945, 1971) — The Constitution imposes strict limits on what can be punished and how it can be proven. 2001/12/20 — Hurst's Law of Treason, Introduction by Jon Roland, Published in University of West Los Angeles Law Review, Vol. 34, 2002. 2001/12/15 — Conflict of Criminal Laws, Edward S. Stimson (1936) — Jurisdiction for a criminal offense is limited to the territory where the offender is when the offense is committed, not where the effects occur. 2001/09/14 — Discourses Concerning Government, Algernon Sidney (1698) — Built principles of popular government from foundation of natural law and the social contract. 2001/09/10 — Patriarcha, Robert Filmer (1680) — This defense of absolute monarchy provoked Locke and Sidney to write their major works. 2001/09/01 — The Constitutional Documents of the Puritan Revolution: 1625-1660, Samuel Rawson Gardiner, ed. (1906) — The English "commonwealth" led by Cromwell didn't endure, but many of its ideas did. 2001/08/28 — New Views of the Constitution of the United States, John Taylor (1823) — A discourse on the constitutional nature of the American union reflecting views of Jefferson and Madison. 2001/08/15 — Selected Political Writings of Voltaire, (~1764) — Includes The Philosophy of History and A Treatise on Toleration. 2001/08/12 — De Republica Anglorum, Thomas Smith (1565, 1583) — Written while he was ambassador to France, describes the constitution of England under Elizabeth I in a way that indicates tendencies toward republican ideals. 2001/08/07 — The American Republic: its Constitution, Tendencies, and Destiny, O. A. Brownson (1866) — Argument against secession, distinguishes the constitution of government from the underlying constitution of the society, and territorial from socialistic or egoistic democracy. 2001/07/24 — Utilitarianism, John Stuart Mill (1863) — Ethical theory that formed the basis for his political theory. 2001/06/24 — Politica, Johannes Althusius (1614, Abr. & tr. Frederick S. Carney) — First presented a comprehensive theory of federal republicanism based on a covenantal model of human society. 2001/06/22 — Selected Political Works of John Milton — Includes Areopagitica (1644), Tenure of Kings and Magistrates (1649), and Defense of the People of England (1651). 2001/06/11 — Sources of English Constitutional History: 600-1937, Carl Stephenson & Frederick George Marcham (1937) — Collection of the documents that define the English "constitution". 2001/03/22 — The Origins of Modern Constitutionalism, Francis D. Wormuth (1949) — Historical analysis of the key constitutional concepts. 2001/02/16 — The Elements of Law Natural and Politic, Thomas Hobbes (1640) — Discussion of the natural law foundations of government. 2001/02/15 — The Law of War and Peace, Hugo Grotius (1625) — Sets out principles of natural law and the laws of nations. 2001/01/31 — Constitutionalism: Ancient and Modern, Charles Howard McIlwain (1947) — Discourse on the origins and development of constitution theory. 2000/11/18 — The Principles of Morals and Legislation, Jeremy Bentham (1781) — Introduced utilitarianism, to provide a better theoretical foundation for penal statutory law than natural law theory. 2000/11/09 — Of Crimes and Punishments, Cesare Beccaria (1764) — Set out rights of the accused in criminal proceedings. Argues for crime prevention over punishment, and against the death penalty and torture. 2000/10/13 — Selected Works, Harvey Wheeler — Papers on Francis Bacon and constitutional history and law. 2000/09/08 — The Revival of Natural Law Concepts, Charles Grove Haines (1930) — Review of natural law theory as the foundation of constitutional law. 2000/08/31 — The Principles of Natural and Politic Law, J. Burlamaqui (1748, tr. Thomas Nugent 1752) — Commentary on the natural law ideas of Grotius, Hobbes, Puffendorf, Barbeyrac, Locke, Clarke, and Hutchinson. 2000/07/02 — Points of Rebellion, by William O. Douglas — Supreme Court justice reveals the breadth and depth of official corruption and abuse of constitutional rights and limits on powers. 2000/06/14 — Public Safety or Bills of Attainder?, Jon Roland. Published in University of West Los Angeles Law Review, Vol. 34, 2002. 2000/06/05 — Man the Reformer, Ralph Waldo Emerson (1841). 2000/04/26 — Pro Se Handbook — Local copy of guide available from here. 2000/03/30 — On the Duty of Man and Citizen According to Natural Law, Samuel Pufendorf (1673, 1682 tr. Frank Gardner Moore) — Based law and right on natural law. 2000/03/25 — Art of War, Sun Tzu (475-221 BC) — Maxims for military strategists. 2000/03/24 — Plato Redivivus, Henry Neville (1681) — Argued for limits on the powers of government. 2000/03/15 — Selected Works of Thomas Jefferson — Includes complete Writings of Thomas Jefferson, Albert Ellery Bergh, ed., 19 vol. (1905). 2000/03/14 — Selected Works of Walter Moyle, (~1696-1721, pub. 1796) — Includes Constitution of the Roman State, a commentary on English constitutional issues from a Whig perspective. 2000/03/07 — Second Amendment Law Library — Scholarly articles, federal and supreme court decisions, and legal briefs. 2000/03/03 — Selected Works of the Levellers (1645-9) — Militia leaders who sought legal reforms later sought by the American Revolution and embodied in the U.S. Constitution and Bill of Rights. Includes An Agreement of the Free People of England, an early attempt at a republican constitution. 2000/02/24 — Communist Manifesto, Karl Marx and Friedrich Engels (1848) — Statement of their objectives. 2000/02/24 — The Man versus the State, Herbert Spencer (1884) — How the servants try to become the masters and majorities become oppressive. 2000/02/24 — The Doctrine of Fascism, Benito Mussolini (1932) — Provided tyranny a formal doctrine. 2000/02/23 — Utopia, Thomas More (1516) — Satirical analysis of shortcomings of his society and a vision of what could be. 2000/02/23 — The Moral Equivalent of War, William James (1906) — Seeks solution to problem of how to sustain political unity and civic virtue without war or a credible threat. 2000/01/19 — Selected Political Works of Richard Price — Includes Civil Liberty (1776) and Importance of the American Revolution (1784). 2000/01/17 — Six Books of the Commonwealth, Jean Bodin (~1590 tr. Richard Knolles 1606, tr. & abr. M.J. Tooley 1955) — Originated modern ideas of sovereignty, the state, and citizenship. 2000/01/13 — Relectiones, Franciscus de Victoria (lect. 1532, first pub. 1557) — Includes De Indis and De iure belli, arguing for humane treatment of native Americans and of enemies in war, providing the basis for the law of nations doctrine. 1999/12/13 — Undermining the Constitution, Thomas James Norton (1950) — Constitutional scholar examines departures from constitutional compliance arising from New Deal. 1999/11/05 — The Virginia Report, J.W. Randolph, ed. (1850) — Documents and commentary arising out of the controversies attending the Alien and Sedition Acts, including the Kentucky Resolutions of 1798 and 1799 and the Virginia Resolution of 1798, which set forth the "Doctrine of '98" concerning constitutional interpretation, and led to the "Revolution of 1800", the dominance of the Jeffersonians, and the demise of the Federalist Party. 1999/10/13 — Art of War, Niccolò Machiavelli (1520) — Argues for a strong militia system. 1999/10/12 — Discourses on Livy, Niccolò Machiavelli (1517) — Argues for the ideal form of government being a republic based on popular consent, defended by militia. 1999/10/03 — LaRosa Reports, by Benedict D. LaRosa — Report on Ruby Ridge, Mt. Carmel, and Davidian trial. 1999/09/27 — Votescam, by James & Kenneth Collier — Report of investigation of vote fraud in the United States. Guide for how to conduct such investigations. 1999/09/17 — Documentary History of the Bill of Rights— From the English Bill of Rights through the proposed amendments of the state ratifying conventions to the drafts debated in Congress before adopting the final version. 1999/09/11 — Militia Treatises, James B. Whisker — Standard references on the subject. Includes The Militia(1992) and The American Colonial Militia (1997). 1999/08/27 — A Defense of the Constitutions of Government of the United States of America, John Adams (1787-89) — Argued for a broad interpretation of national powers. Comprehensive collection of quotes from political philosophers and historians that influenced the Founders. 1999/08/25 — Perpetual Peace, Immanual Kant (1795) — Further discussion of natural right and the plan for peace. 1999/08/08 — Questions of Public Law, Cornelius van Bynkershoek (1737) — Develops the law of nations and constitutional (public) law beyond Grotius and Pufendorf. 1999/08/06 — Federal Usurpation, Franklin Pierce (1908) — Historical and constitutional analysis of how corruption, zealotry, and incompetence combined to violate the Constitution. 1999/08/04 — The Constitution of the United States: Its History, Application, and Construction, Chapter 5: Legislative Powers, Chapter 25: Police Power, David K. Watson (1910) — Comparison of the powers of the national and state governments. 1999/07/29 — Vindiciae Contra Tyrannos (Defense of Liberty Against Tyrants), "Junius Brutus" (Orig. Fr. 1581, Eng. tr. 1622, 1689) — In 1683 it was ordered to be burned. 1999/07/28 — Introduction to the Metaphysics of Morals, Immanual Kant (1785), tr. W. Hastie (1785). 1999/07/28 — Fundamental Principles of the Metaphysics of Morals, Immanual Kant (1785), tr. Thomas Kingsmill Abbott (1785). 1999/07/27 — Selected Writings of Thomas Paine — Includes Common Sense (1776) and Rights of Man (1792). 1999/07/26 — Selected Works of Edmund Burke — Commentary on the American and French Revolutions and the political issues they raised. 1999/07/24 — The Law of Nations, Emmerich de Vattel (1758) — Based constitutional and civil law on the law of nations. 1999/07/20 — The Grand Jury, George J. Edwards (1906) — Classical treatise on the grand jury, unequalled to this day. 1999/07/08 — The New Atlantis, Francis Bacon (1626) — Utopian vision of the new world. 1999/07/04 — Constitutional Conventions, Roger Sherman Hoar (1917) — Treatise on the way a body politic manifests its sovereignty.